War & Peace, commemorating the end of the Great War. A programme of music and readings, with organ. 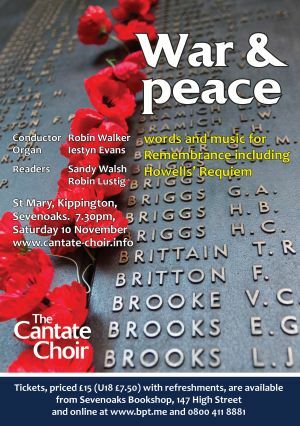 Cantate’s next performance is a special concert to mark the centenary of the end of the First World War. The programme includes songs and readings from poems written during and after the War alongside settings of sacred texts that reflect the choral traditions of the last century. The centrepiece of the concert will be Herbert Howells’ Requiem. Other works include pieces by English composers of the 20th Century, such as Ireland and Elgar, as well as music by Messiaen, Pärt and Whitacre, music to evoke both sadness and hope. The programme is approximately 90 minutes without an interval. Tickets available at Sevenoaks Bookshop, online at www.bpt.com or by phone 0800 411 8881.